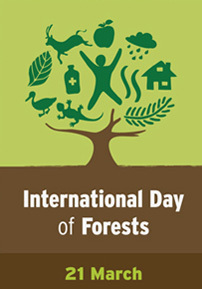 In celebration of the second International Day of Forests, UN Secretary-General Ban Ki-moon noted the important benefits of forests: habitat provision for 80 percent of all terrestrial biodiversity; support of an estimated 1.6 billion people; adaptation and mitigation to climate change; and the maintenance of a timber and wood industry that accounts for almost 1 percent of global gross domestic product (GDP). Members of the Collaborative Partnership on Forests held many activities around the world. The Executive Secretary of the Convention on Biological Diversity (CBD) issued a statement highlighting that forests are central to sustainable development, but that their multiple values are still not adequately reflected in policies. The CBD noted that actions to achieve the Aichi Biodiversity targets can address this shortcoming, especially with regard to Target 5, which calls for the rate of deforestation and forest degradation to be halved. The Centre for International Forestry Research issued a video to reflect on how forestry needs to be part of landscapes-based solutions for sustainable development and climate mitigation. FAO released new satellite-based data on forest resources. A video featured the multiple benefits of forests and urging people to reflect on their value and take action to support their sustainability was launched. In addition, the FAO held a seminar on global forest monitoring (slideshare presentations and webcast), which emphasized recent technologies and approaches employed through FAO projects. The Global Environment Facility (GEF) issued a news article highlighting the release of Global Forest Watch, a real time tracking tool to monitor global deforestation. The International Tropical Timber Organization (ITTO) emphasized the importance of tropical forests and the multiple ecosystem services they provide. The Executive Secretary of the UN Convention to Combat Desertification (UNCCD) emphasized the link between the loss of forests and conflict, and called for increased efforts to restore degraded forests and land. An event held by the UN Forum on Forests (UNFF) at UN Headquarters in New York, US, to mark the Day convened "Forest Heroes and filmmakers to spotlight the role of women as agents of change for forests and sustainable development." UNFF also organized a film and photo exhibit.